Columnist Justin Dunham is a big champion of marketing technology, but succeeding with martech requires more than just selecting the right tools -- after all, tools only work if there's good process and culture already behind them. There are 5,000 different technologies in the Martech Landscape. And those are divided into over 50 different categories. It’s a lot to deal with: analytics, web technology, CRM, marketing automation and many, many other types of marketing technology. Within a marketing technology stack, you can easily have dozens of layers, and each software package has its own specific capabilities, its own user interface and its own specific ways of interacting with the rest of the marketing technology stack. And of course, when it comes time to look at how marketing is performing, each tool generates its own reports that need to be interpreted and acted on. As marketing technologists, we think of ourselves as owning all this stuff, though, right? Our job is to manage the data and systems and analytics and reporting so that other people don’t have to worry about it. So it shouldn’t be too overwhelming to manage. But in fact, our fellow marketers are interacting with marketing technology more and more every day. your blog manager, who has to be able to pull data from Google Analytics. your event manager, who needs to understand how Salesforce is set up. your product marketers, who have questions about who’s in the database. So how can we make marketing technology easier for the rest of marketing to cope with? In other words, how we can help everyone become a marketing technologist? The first principle is that good process should always come before tools. To explain why, here’s a story about a $40,000 mistake I made. I was running marketing ops at a company that was having problems with content marketing. We didn’t know if what we were publishing was working, and beyond that, we didn’t have a good process to get the right things drafted and published on time. We couldn’t track whether we were actually talking to the people we wanted to be talking to. We couldn’t easily get approvals and control content workflow, and even publishing our content took several steps. So we did a vendor selection process. I got the CMO to sign a contract and roll it out in the organization, to a lot of fanfare. A few weeks after the rollout, I was hearing really good things. People were excited! I logged into the tool to see how people were using it, what data was in it, and what we were learning. But there wasn’t anything there. People weren’t using it. In fact, some people to whom I had sent logins had not even confirmed their email addresses. I learned a lot from that particular experience. But the main thing is that tools only work if there’s good process and culture already behind them. If you try to bring in a martech tool where people haven’t figured out the very basics of what it is they’re trying to do, your rollout will fail. People are grappling with a basic problem that they have, and now they’re trying to learn to use a new tool to do a job that they didn’t know how to do in the first place. Martech is an accelerator; it doesn’t go in place of doing the hard work up front. The same thing is true about data, by the way. I’ll bet that in your inbox you have an automated report or two that you signed up for months ago that you never use. At the time, you might have been very excited about the possibilities for this new data. And people often are: I have clients for whom I pull reports with dozens of pages every week. But there’s no process to decide how to act on the data. So it’s just data. And not only does the underlying problem not get solved, but now there are lots of extra reports for people to read and discuss without really being able to do anything about them. Process first, then tools. Process first, then data. Once you’ve got the process in place, you’re ready to start building new reports or considering a new marketing technology tool. In this moment, think about usability. Why? Because poorly designed tools take more time to use and result in more user error. Except they’re not labeled. So you press what you think is the “up” button, but it’s actually the “down” button. And you watch the elevator go past you instead of picking you up, because you pressed the wrong button. And now you’re really late to the meeting. That elevator control panel is a good example of a poorly designed tool. It’s confusing, it’s unpredictable, it causes mistakes, and it creates anxiety when people have to use it. 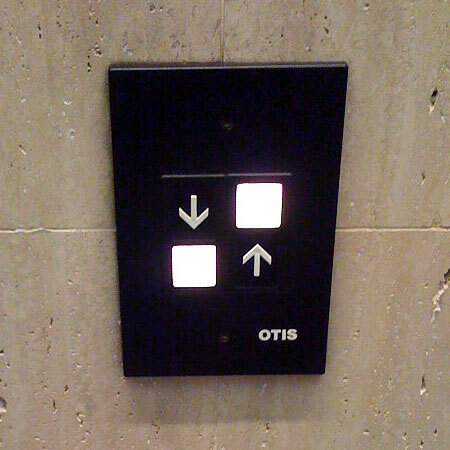 And the thing is, a lot of marketing technology tools are like this poorly-labeled elevator control panel. So when we choose and implement marketing technology, we need to think about how to make it easy for people to use. Accessibility. Do people know the thing they’re trying to use? Is it somewhere they can access it easily? Navigability. You want people to be able to orient themselves easily within whatever they’re using. For example, a lot of marketing automation tools have inscrutable menu items at the top that we all learn how to use eventually but that don’t have an intuitive meaning. Predictability. When you hit a button, you should know in advance what’s going to happen. Forgiving. Mistakes should be hard to make and easy to fix. When you’re doing your vendor selection process, have a section of your requirements document that talks about usability. Can people use this tool? Is it navigable and predictable, and does the design of the tool make errors difficult to make and easy to fix? That’s helpful for people within the marketing technology organization, whose time will be saved by good tools that are easy to use. It’s even more helpful for people who not marketing technologists and who are less comfortable with these tools. So, include usability in your spec and what you’re thinking about it. Be willing to maybe give up something else for it. The other thing I would say is that fixing and streamlining the user interface is more important than you think. A lot of people think about “cosmetic” projects to clean things up. For example, I’ve seen many Salesforce layouts that are completely broken, and there’s no time to fix them. They have fields that aren’t being used, they’re not laid out in a logical way. A lot of marketing tools end up like this after years of use. Imagine how great it would be if somebody took the hour or two to really clean this up; all of a sudden, a few dozen reps, or hundreds of reps, could go in and see the information they needed right away and focus on talking to the prospect, instead of trying to hunt for what they want. Digital marketing is going through enormous changes, and marketing technology is powering them. Martech professionals shouldn’t assume they can insulate their organizations from the complexity that comes with this shift. Instead, we should find ways to help our organizations cope with and effectively use new technologies. In my next column, I’ll talk about some of the cultural changes we can promote, as well, to help our marketing organizations evolve.